The opening scene of The Butcher Boy depicts a prepubescent boy wearing a full-body cast on a hospital bed and facing a serious injury. While several concerned adults stand over him, we wonder how he reached such a dire state. Was he a victim of serious abuse, and did the kid bring this action upon himself? The answer actually rests somewhere in the middle and is revealed in this complex story from Irish Director Neil Jordan (The Crying Game, Michael Collins). Adapted from the Neil McCabe novel, this dark and original picture takes us deep into the mind of a very troubled youngster. The story occurs in the early '60s and focuses on the young life of Francie Brady (Eamonn Owens)�an energetic, red-haired boy who avoids his nasty home life through eerie dreams and hanging with his best pal Joe (Alan Boyle). Francie's father (Stephen Rea) spends his days drinking heavily, which leads him to act brutally towards his wife (Aisling O'Sullivan) and son. His only positive activity is playing the trumpet, which brings some fun to the household, but this enjoyable time is fleeting. This depressing home life leads Francie's mother to ponder suicide, which sends him even further into the dream world. The adult Francie narrates the proceedings, which makes him less reliable and brings the reality of many scenes into serious question. When we observe apparently snooty adults acting strangely, their behavior comes from Francie's viewpoint, which generates confusion about the actual events. Francie's visions involve pigs, nuclear explosions, and the Virgin Mary�played with surprising beauty by Sinead O'Connor. She was famous at the time for ripping up the Pope's picture while performing on Saturday Night Live several years earlier, so this casting was considered sacrilege by some Catholics. The early moments convey the fun of being a kid and acting silly, but Francie's acts convey added menace beneath the surface. When he messes with the thin, quiet Phillip Nugent (Andrew Fullerton) with Joe, there's something in his demeanor that's more frightening than the typical bully. Their #1 enemy is Mrs. Nugent (Fiona Shaw), who believes the boys are a nuisance and even sends a few bullies to threaten them. Francie responds with a stunning act that shocks the civilized family and gets him shipped to a religious boarding school. This nasty move feels more justified because we've observed Mrs. Nugent from Francie's viewpoint. The accuracy of his perception is never clarified, but his future mania could reveal some cracks in this one-sided opinion. Neil Jordan's career has consistently offered unconventional looks at familiar genres, including the baffling fairy tale of In Dreams and the epic horror story of Interview with a Vampire. This film might be his most unique creation because it consistently defies expectations and takes the plot in surprising directions. When Francie becomes the possible prey of a creepy priest, we expect him to become the story's ultimate victim. Instead, Francie responds with a swift and nasty resolve that leaves us wondering about his mental state. Conflicts arise when his "blood brother" Joe strays to other friends, which devastates Francie. Acting similar to a spurned lover, he takes this rejection very personally. Will his uneven emotional state lead to more disastrous acts? The answer is very shocking, and Jordan presents everything with an utter disregard for conventional structure. His inventive approach keeps us guessing, but it also leads to some baffling and frustrating moments. 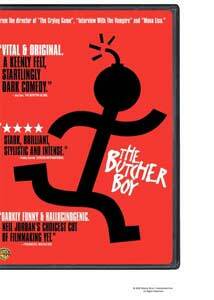 The Butcher Boy's anecdotal style helps to create some light-hearted moments within the saddening tale. As Francie becomes nastier and journeys to "save" his friend, the tone becomes more distressing, but it never evolves into unfortunate melodrama. This change would have killed the picture, and Jordan wisely uses innovative tactics to keep the story afloat. The epilogue does feel too quick and gives us little information, which undercuts the strength of the earlier action. However, a strong lead performance from Owens keeps us involved and helps to deliver a memorable film. Jordan's quirky approach works most of the time and generates a unique experience, but it also leads to a few missteps. I enjoyed a good portion of Francie's story and recommend it for viewers looking for something more than the typical drama. Image Transfer Review: The Butcher Boy appears with a 1.85:1 anamorphic widescreen transfer that presents the story in solid fashion. However, it does include a significant amount of grain and has some strangely muted colors. The defects never create a major distraction, but they do fall a bit short of the expected standards. I expect that Warner did not consider this catalog release to be a top priority and did not spend much time on improving the transfer. Audio Transfer Review: This release offers a suitable 5.1-channel Dolby Digital track that presents the story effectively but without great aplomb. The dialogue is clear, which allows viewers to have a better chance of understanding the characters' Irish accents. Much of the action comes from the front and middle channels, with the rear speakers being used intermittently. Extras Review: The Butcher Boy includes a feature-length commentary from director and co-writer Neil Jordan. He warmly discusses the film's creation and delves into the specific details involved with adapting the novel and shooting the film. However, his quiet voice and low-key delivery eventually lead the track into mundane territory. Serious fans will probably enjoy this inclusion, but it falls short of providing an interesting experience. The other extras include three deleted scenes and the original theatrical trailer. The cut moments run for a little more than three minutes and present a few moments possibly removed due to time concerns. Two of them occur with the adult Francie and involve him receiving and playing a new trumpet for a group of dancing revelers. The Butcher Boy made a considerable impression with critics and audiences during its 1998 release, but it has been largely forgotten since that time. Although this DVD release could have used better extras, it deserves a look from viewers like me who missed it originally. You may be confused and shocked, but I promise that you will not be bored by this distinctive film.